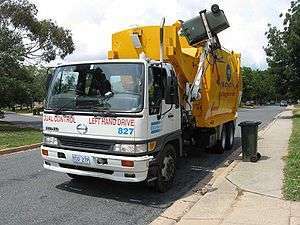 Kerbside collection, or curbside collection, is a service provided to households, typically in urban and suburban areas of removing household waste. It is usually accomplished by personnel using purpose built vehicles to pick up household waste in containers acceptable to or prescribed by the municipality. Prior to the 20th century the amount of waste generated by a household was relatively small. Household wastes were often simply thrown out the window, buried in the garden or deposited in outhouses (see more at urban archaeology). When human concentrations became more dense, waste collectors, called nightmen or gong farmers were hired to collect the night soil from pail closets, performing their duties only at night (hence the name). Meanwhile, disposing of refuse became a problem wherever cities grew. Often refuse was placed in unusable areas just outside the city, such as wetlands and tidal zones. One example is London, which from Roman times disposed of its refuse outside the London Wall beside the River Thames. Another example is 1830s Manhattan, where thousands of hogs were permitted to roam the streets and eat garbage. A small industry developed as "swill children" collected kitchen refuse to sell for pig feed and the rag and bone man traded goods for bones (used for glue) and rags (essential for paper manufacture prior to the invention of wood pulping). Later, in the late nineteenth century, trash was fed to swine in industrial. As sanitation engineering came to be practised beginning in the mid-19th century and human waste was conveyed from the home in pipes, the gong farmer was replaced by the municipal trash collector as there remained growing amounts of household refuse, including fly ash from coal, which was burnt for home heating. In Paris, the rag and bone man worked side by side with the municipal bin man, though reluctantly: in 1884, Eugène Poubelle introduced the first integrated kerbside collection and recycling system, requiring residents to separate their waste into perishable items, paper and cloth, and crockery and shells. He also established rules for how private collectors and city workers should cooperate and he developed standard dimensions for refuse containers: his name in France is now synonymous with the garbage can. Under Poubelle, food waste and other organics collected in Paris were transported to nearby Saint Ouen where they were composted. This continued well into the 20th century when plastics began to contaminate the waste stream. From the late-19th century to the mid-20th century, more or less consistent with the rise of consumables and disposable products municipalities began to pass anti-dumping ordinances and introduce kerbside collection. Residents were required to use a variety of refuse containers to facilitate kerbside collection but the main type was a variation of Poubelle's metal garbage container. It was not until the late 1960s that the green bin bag was introduced by Glad. Later, as waste management practices were introduced with the aim of reducing landfill impacts, a range of container types, mostly made of durable plastic, came to be introduced to facilitate the proper diversion of the waste stream. Such containers include blue boxes, green bins and wheelie bins or MGBs. Over time, waste collection vehicles gradually increased in size from the hand pushed tip cart or English dust cart, a name by which these vehicles are still referred, to large compactor trucks. Glass for collection in Edinburgh, Scotland. Kerbside collection is today often referred to as a strategy of local authorities to collect recyclable items from the consumer. Kerbside collection is considered a low-risk strategy to reduce waste volumes and increase recycling rates. Materials are typically collected in large bins, coloured bags, or small open plastic tubs, specifically designated for content. Kerbside collection of recyclable resources is aimed to recover purer waste streams with higher market value than by other collection methods. If the household incorrectly separates the recyclable elements, the load may have to be put to landfill if it is deemed to be contaminated. Kerbside collection and household recycling schemes are also being used as tools by local authorities to increase the public's awareness of their waste production. Kerbside collection is commonly considered to be completely environmentally friendly. This may not necessarily be the case as it leads to an increased number of waste collection vehicles on the road, in themselves contributing to global warming through exhaust emissions until the time of their conversion to clean energy. New and emerging waste treatment technologies such as mechanical biological treatment may offer an alternative to kerbside collection through automated separation of waste in recycling factories. Halifax Regional Municipality (HRM) in Nova Scotia, Canada, with a population of about 375,000, has one of the most complex kerbside collection programmes in North America. Based on the green cart, it requires residents to self-sort refuse and place different types at the kerb on alternating weeks. As shown in the photo at left, week 1 would see the green cart and optional orange bags used for kitchen waste and other organics such as yard waste. Week 2 would permit non-recoverable waste in garbage bags or cans. Blue bags are used for paper, plastic and metal containers. Together with used grocery bags containing newspapers, they may be placed on the kerb either week. In summer, the green cart is emptied weekly due to the prevalence of flies. HRM has achieved a diversion rate of approximately 60 percent by this method. Calgary, Alberta has adopted "Curbside" Recycling and uses blue bins. The blue cart programme accepts all types of recycables, including plastics 1-7. It is picked up weekly for the cost of $8.00 per month. This programme is mandatory. In 1981 Resource Integration Systems (RIS) in collaboration with Laidlaw International tested the first blue box recycling system on 1500 homes in Kitchener, Ontario. Due to the success of the project the City of Kitchener put out a contract for public bid in 1984 for a recycling system city wide. Laidlaw won the bid and continued with the popular blue box recycling system. Today hundreds of cities around the world use the blue box system or a similar variation. Many Canadian municipalities use "green bins" for kerbside recycling. Others, such as Moncton, use wet/dry waste separation and recovery programmes. Kerbside collection bins in Dunedin, New Zealand. The yellow-liddied wheelie bin is for non-glass recyclables, and the blue bin is for glass. The two bins are collected on alternating weeks. Official council bags are used for general household waste, and are collected weekly. Auckland City Council: Two 240-litre wheelie bins are supplied: a red-lidded bin for general refuse, collected weekly, and a blue-lidded bin for recyclables, collected fortnightly. Christchurch City Council: Three wheelie bins are supplied: a 140-litre red-lidded bin for general refuse, a 240-litre yellow-lidded bin for recyclables, and an 80-litre green-lidded bin for organic waste. The organic waste bins are collected weekly, while the recyclables and general refuse bins are collected on alternating weeks. Hamilton City Council and Hutt City Council: A 45-litre bin is supplies for recyclables, collected weekly. General refuse is collected weekly using user-pays official council bags. Dunedin City Council, Palmerston North City Council and Wellington City Council: Two bins are supplied: a 45-litre or 70-litre bin for glass, and an 80-litre or 240-litre wheelie bin for non-glass recyclables. These two bins are collected on alternating weeks. General refuse is collected weekly using user-pays official council bags. Rodney District Council: A 45-litre bin is supplies for recyclables, collected weekly. There is no council collection of general waste, and all general waste collection is carried out by independent companies. Taupo District Council: A 45-litre bin is supplies for recyclables, collected weekly. General refuse is collected weekly using user-pays system of orange tags - one orange tag is to be placed on a standard rubbish bag up to 60 litres capacity, or half an orange sticker can be placed on two supermarket bags tied together. Upper Hutt City Council: Recycling is to be placed in plastic bags, with paper and cardboard collected in the first week, and plastic, metal and glass in the second week. General refuse is collected weekly using user-pays official council bags. Waitakere City Council: A 140-litre wheelie bin is provided for recyclables, collected fortnightly. General refuse is collected weekly using user-pays official council bags. By 1996 the New Zealand cities of Auckland, Waitakere, North Shore and Lower Hutt had kerbside recycling bins available. In New Plymouth, Wanganui and Upper Hutt recyclable material was collected if placed in suitable bags. By 2007 73% of New Zealanders had access to kerbside recycling. Kerbside collection of organic waste is carried out by the Mackenzie District Council and the Timaru District Council. Christchurch City Council is introducing the system to their kerbside collection. Other councils are carrying out trials. Another controversial issue in the uk is the frequency of the waste collections. To save money, many councils are cutting the frequency of both general waste and recyclables collections. This has led to problems from larger families, and has led to overflowing and fly tipping. For example, previously, Bury Council collected general waste once a week and recyclables fortnightly. This has now changed to fortnightly for general waste and monthly (every 4 weeks) collection of recyclables. A few councils are using "forced" recycling, by replacing the large, 240l general waste bin with a smaller 180l or 140l bin, and using the old 240l one for recyclables. This may be made worse by fortnightly collections of the "small" bin, and strict rules such as "No extra bags will be taken" and "Bin lids must be fully closed". Stockport Council is a notable user of this scheme. 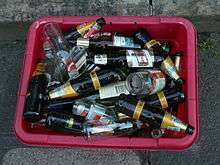 Their recycling rates have risen substantially as a result, but there are usually complaints from families. Trafford council also use a similar scheme, but the small grey bin is emptied every week. In addition, the two named councils, and more, collect food waste together with garden waste, by sending out kitchen caddies and compostable liners. These prevent food waste (including meat) from going to landfill, and to increase the councils recycling rate. The food and garden waste is usually collected weekly or fortnightly, and is taken to an In Vessel composter or Anaerobic digester, where the waste is turned into soil improver for use on local farms. In the north west, all the glass collected is used within the UK, around half of the plastics and cans are used in the UK; the rest is sent further afield to Europe or China to be made into new products, and paper and paperboard collected is sent to local paper mills to be made into newspapers, tissues, paperboard and office paper. Again some of the paper will be sent further afield. Some councils only have 3 bins- general, organic and recyclables. This means that plastics, cans and glass go in the same container as paper and cardboard. Although this is much easier for the residents, there is more sorting required, and the paper quality is sometimes of a low grade due to food contamination or shards of glass in the paper, and so this scheme is criticized. Also, most councils require residents to remove caps from bottles and rinse them out to avoid smells. This is because the lids are made from a different type of plastic (PP) to the bottle (PET/HDPE) - although by collapsing the bottles and folding them over like toothpaste tubes and rescrewing the caps in place enables the volume of bottles to be drastically reduced, thereby increasing the amount of bottles that can be carried in the recycling bins. In fact many bottlers, especially bottled water companies, have now designed their bottles to be collapsible; though this message has not been effectively disseminated to the consumer. A collapsable bottle takes between 25% and 33% of the space a non-collapsed bottle. Labels are rarely required to be removed, however. This also means that only plastic bottles are recycled. Councils are still trying to make clear that plastic tubs (yogurts, desserts and spreads), bags and cling film cannot be recycled through the kerbside economically. If too much contamination is collected then this results in the whole vehicle load going to landfill at a high cost. Contamination is usually a problem if recyclables are collected in wheelie bins, as the worker can only look at the top; there may be contamination 'hidden' at the bottom. Councils that use many bags and boxes (Edinburgh) suffer from less contamination but are complicated and the loose paper and cardboard, and recycling bags are blown around, and paper can be wet. In the province of Gipuzkoa, this system is implanted in many towns as Usurbil, Hernani, Oiartzun, Antzuola, Legorreta, Itsasondo, Zaldibia, Anoeta, Alegia, Irura, Zizurkil, Astigarraga, Ordizia, Oñati and Lezo, where the common used name in basque is atez-atekoa, which means door-by-door. Due to the big success in this towns, with more than the 80% of the waste recycled, 34 towns in Gipuzkoa are studying to set this system up in 2013, like Arrasate, Bergara, Aretxabaleta, Eskoriatza, Legazpi, Tolosa or Pasaia. The atez-ate system consists in hanging each kind of rubbish in a hanger outside the house a certain day or days in a week. For example, in Hernani, they have three days to hang their organic rubbish, two days for plastics and metallics, one for paper and one for rejects residuals. This system started in the town of Usurbil in the year 2009, due to the incinerator of the region of Gipuzkoa was going to build in this town, exactly in the neighborhood of Zubieta. Three years after, the construction of the incinerator was paralyzed by the government of the region, suggesting that the incinerator was a source of contamination and the high cost of the building. This type of collection service is subject to growing criticism. The large (Wheelie bin) container encourages the "out of sight" rubbish mentality and invites more rubbish to be disposed. The bins and collection trucks are not suited to narrow roads or houses with steep driveways or steps. They lock local authorities into capital intensive equipment programmes and multi-national providers. Co-mingled recyclables are sometimes not being successfully managed by automated sorting stations and the rates of diversion are low. In some cases, this results in mountains of unsorted recyclables. Many use small plastic boxes, bags and lockable outdoor food waste 'caddies' which get blown around and lost, bad for recycling participation. ↑ Still, by 1902, only 40 percent of US cities offered curbside collection. See: C.-E.A. Winslow and P. Hansen, "Some Statistics of Garbage Disposal for the Larger American Cities in 1902"
↑ "Recycling - Taupo District Council". Retrieved 2010-08-04. ↑ "Refuse - Taupo District Council". Retrieved 2010-08-04. ↑ "The State of New Zealand's Environment". Ministry for the Environment (New Zealand). 1997. Retrieved 2008-03-27. ↑ Ministry for the Environment (December 2007). Environment New Zealand 2007. Ministry for the Environment (New Zealand). ISBN 978-0-478-30192-2. Retrieved 2008-03-27. ↑ http://www.foe.co.uk/campaigns/waste/news/recycling_bill_success.html, Friends of the Earth. ↑ "Waste & Recycling Bins". www.cpkitchencomponents.co.uk. Retrieved 19 January 2016. ↑ "Memorandum submitted by Essex Friends of the Earth". www.publications.parliament.uk. Retrieved 19 January 2016.